A broken dishwasher is a disaster. Most households run at least 1 load of dishes a day. But if you have roommates or children, the number of dishes piling up in the sink can get out of control pretty fast. You'll be glad to know though that dealing with dirty dishes isn’t as bad as it seems. Many of us grew up with dishwashers and dread the thought of hand washing dishes. But, there is a small percentage of the population that enjoys hand washing. Some claim it’s therapeutic, or almost meditative and others believe it leaves their dishes cleaner. Maybe you'll be a believer before you new dishwasher arrives. In the meantime, try these tips, tricks, and hacks to tackle your mountain of dishes. While some people say that it's best to find a bin to put dirty dishes in, it's difficult to find one that sits inside your sink and allows you to fit more than a few cups into it. Ditch the removable bin idea and focus on something you can master, stacking. Starting with a pot is the best method because it has handles and holds water. You can shove all of your silverware in the bottom and top it off with cups. When mastering the art of stacking dirty dishes, keep mobility in mind. It's great to see a decent pile in one side of the sink, but washing by hand does require both sides of the sink. Or else you'll continuously be draining and refilling your sink. When you’re stacking, you can take the approach that leaves you with the worst part, or the most natural part first. Many people like to tackle things like plates and cups head on. It's very gratifying to see the drying rack pile up. Or, if you're not worried about the drying rack, it's nice to see neat piles of dishes where only moments ago, there were dirty stacks of plates everywhere. But, as gratifying as that is, it sets some people back. If you find yourself struggling to make it through that last stretch of dishes at the bottom of the sink, you can always switch up the order. Take on the silverware, measuring cups and odd utensils first. This approach can leave you with the reasoning that you must finish cleaning the dishes because all the useful things are still in the sink. As you were stacking your dishes, you probably realized that some still have leftovers from Tuesday. Other dishes might have traces of crusted on food that actually got worse overnight. But don’t worry there are solutions to these obstacles. First, scraping will make all the difference when it comes to hand washing dishes. As you stack, scrape any food bits left on the plate or in the bowl straight into the trash. It’s easy to let the garbage disposal have it, but at the same time, the disposal will probably be plugged up when your washing your dishes. The best trick for quick and easy scraping is to bring the trashcan to you while you’re stacking your dishes. Second, soaking. If you notice that something is not coming off, don't feel like you have to scrub the bottom of the pan out. Instead, leave a thin layer of water and cut up a lemon. Not only does lemon help get off the tough to scrub stuff, but it gets rid of the burnt taste too. Finally, reheating is something that is a last resort. Whether it’s that chili pot from a few nights ago or batter baked onto a muffin tin, you may need to reheat the dish to get it clean. For pots fill it with water and let it boil on the stove. The heat and water will loosen up the buildup. If you're looking at backing ware like a cookie sheet, muffin tin or Pyrex dish you'll need to turn on your oven. Identify the worst areas of the baked-on food and give them a good rub down with a lemon. Put them in the oven just enough to get warm. A lot of bakeware is easier to clean when it's just cool enough to handle. If you're lucky, you can get ahead of these tricks and get your bakeware, pots, or pans into the sink right after you're done with the cooking. The scouring pads will stay clean and fresh every time you use it. No more stinky odor, grease and burned on messes. For those who don't regularly hand wash dishes, you probably can get by with a bargain soap. But when it comes down to scrubbing away at the dried on crust of pot roast or stew, you need Dawn. There are a lot of soap options, and they aren't necessary. Dawn is the brand that seems to cut through grease the best. If you let something soak overnight in a good soap, you will probably have no problem cleaning it the next morning. Soap isn't the only tool of choice though. There's also scouring pads, scrubbing pads, stainless steel scrubbers, and of course, gloves. Gloves are a big deal for some people, and it's important to take care of your hands. Keep in mind that to your dishes clean, you'll need to use very hot water. Good gloves, the old school yellow ones with the cuff do help take the edge off the heat a little bit. When it comes to handling sponges, and pads though, this comes down to preference. 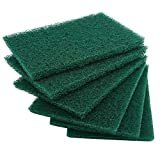 Everyone claims to have their own "best-kept secret" when it comes to choosing a scouring pad. But, the secret is that there isn't one. Overall you should show preference to the soft side of the sponge. This side will do less damage, but it will require more elbow grease. Many people feel that handwashing doesn’t get your dishes as clean as a dishwasher. They aren’t wrong. It’s nearly impossible to handle water temperature that hot, and they aren’t heat dryings. But, you can definitely get your dishes far past the point of clean enough to eat on. First things first, fill up one of the sides of the sink with water that is as hot as you can stand. Add a bit of soap but do keep in mind that there’s a point where more soap does not equal cleaner water. Next, you’ll want to stack your dishes on the counter next to the side of the sink filled with water. This process will be your starting point for every time you do dishes. You'll reach over, grab a dish, and then move to the first side. You'll scrub the dish while completely submerging it in the hot soapy water. Then, you'll move it to the empty side of the sink. When you have a few dishes in the empty side of the sink go ahead and give everything a good rinse. After you rinse everything, you can stack the dishes into the dishwasher to dry. You will work from one side to the other. Once you master it, there is a wonderful sway motion that is reasonably therapeutic. Although it’s not common, some kitchen sinks don’t have sides. They have one giant bowl, and it makes hand washing dishes a bit different. You'll still want to start out by stacking the dirty dishes on the side of the sink in a way that's easy to grab. Then you'll want to stopper the sink and let about 3 inches of water fill the bottom and add soap. It's vital that you can see everything in the sink. Then you'll start grabbing and scrubbing. Be sure to grab the cleanest dishes first. Washing things like water cups, or cereal bowls will keep your sink water cleaner for a longer period of time. When you see that the water is getting gross, pull the drain out. When the water is gone, you should be left with a heap of soap covered dishes. Give each dish a rinse in either hot or cold water. A lot of people take this as the opportunity to give their hands a break from the intense heat. As you rinse the dishes stack them in the dishwasher to air dry. When your sink is clear again, you'll restart the process. A lot of people believe that the bowl sink method wastes more water than the 2-sided sink method. But you're probably using about the same amount of water.